Not only is rock face (rusticated) concrete block found on homes and commercial buildings across the country, it was also frequently used to construct farm buildings during the early 20th century. Makers of the block machines specifically targeted farmers, encouraging them to use rock face block to construct their barns and outbuildings, AND to do it themselves. As we have discussed in previous blogs, concrete block construction was promoted as an easy, cheap, and durable building material that anyone could make themselves. 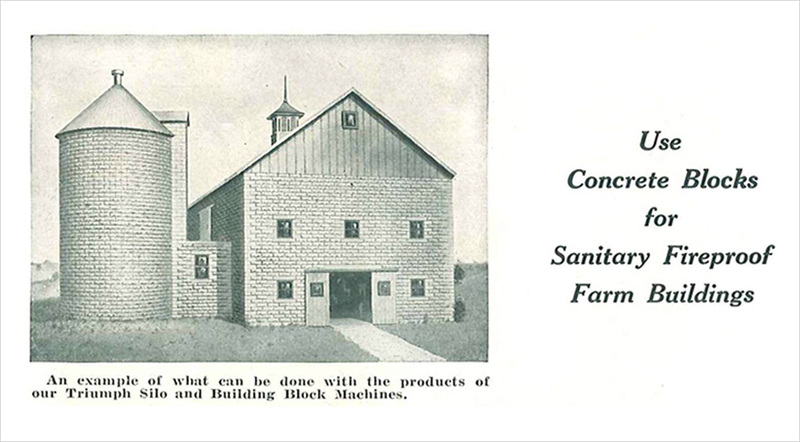 One of the largest manufacturers of these block machines and kit homes, Sears, Roebuck & Co, also created kit plans for barns and other farm outbuildings using concrete block. Even Portland Cement joined in marketing cement and concrete block use for pretty much any structure you could find on a farm. One of the biggest benefits of using concrete block for farm structures was its fire resistance. Barn fires destroyed many a farm and was a huge concern for every farmer. Sears even went as far as to explain to potential buyers that their fire insurance rates would be lower with a concrete structure. Other benefits to using concrete block for farm buildings was its weather resistance, its low maintenance and insulating properties. Sears sold machines that made blocks specifically for corn cribs with slanting holes in the sides to allow for airflow, but prevent water from entering the structure. They sold machines that made curved blocks for building silos and circular barns. The company also sold instructions on how construct any of these buildings on your own.